I was on vacation last week. I didn't go anywhere, but I barely turned on my computer either. My vacation consisted of playing poker, playing Resident Evil 5, going to the movies and catching a Yankees game. There were a lot of bubble mailers waiting for me and one package. 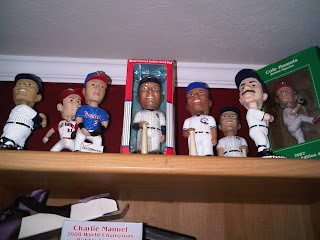 Duane sent this Jeter Columbus Clippers bobblehead that I am sure was bugging him to find him a home. 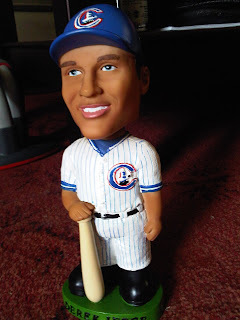 I know how these Jeter bobbleheads are. They just nag at you until they get to be someplace where they can thrive. There were also some cards for Marie that I am sure she is going to love and a Jeter and Kevin Kouzmanoff Allen and Ginter mini AG backs (both needed). 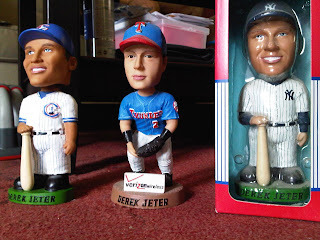 It's good for Jeter because he gets to make a home with a few of his friends: a Trenton Thunder Jeter bobblehead and Yankees Jeter bobblehead, which I have never taken out of the box. Those aren't the only bobbleheads I have. Here's the group of them. I don't have too many, but the ones I have, I love. In order Hideki Matsui (minus the bat. I lost it), Scranton-Wilkes Barre Gavin Floyd (a reporter for a paper up there got it for me because I did a big feature on him when he was in the Phillies organization), Trenton Thunder Jeter, Yankee Jeter, Columbus Clippers Jeter, Paul O'Neill, Don Mattingly and Cole Hamels (still in the box). Below them you can see the top of a box of a Charlie Manuel bobblehead. I couldn't fit him on the shelf. Surely a bobblehead related movie is only a matter of time? I only ever had one bobblehead... It was a freebie from some horse track. A jockey bobblehead. Yep. Yard sale. Can't keep away from junk.